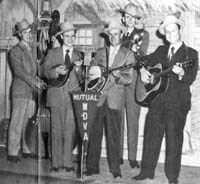 In June of 1949, the Virginia Barn Dance began to broadcast over WDVA out of Danville, Virginia as a regular Saturday night program. The show gained in popularity and got the notice of the Mutual Broadcasting Network as they aired a half-hour segment of the show on their nationwide network. The Virginia Barn Dance was a three and a half-hour show that took place in a special building or as some might call it, a barn, on the Danville Fair Association grounds. The show would kick off each Saturday night at 8:00pm. 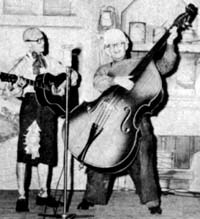 Clybe Moody and his Woodchoppers were the the headline act along with Simon Bowes and the Bowes Brothers. Mug and Jug were the comedy team. 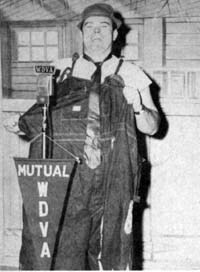 The master of ceremonies for the show was also the Radio Farm Director for WDVA, Homer "Little Bit" Thomasson, who dressed the part of a farmer on occasion. 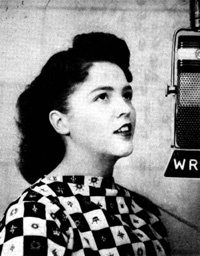 The show appears to have been broadcast from 8:00pm to 9:30pm over WDVA on those Saturday nights. After it went off the air, the chairs in the auditorium / barn were pushed back and the floor cleared. The audience would then dance to the music on the concrete floor that was painted to provide a smooth finish for the dancers to do their numbers. 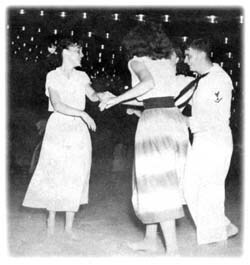 At the time, it may have been a unique feature of a network barn dance show - allowing the patrons to actually participate in the barn dancing following the show. 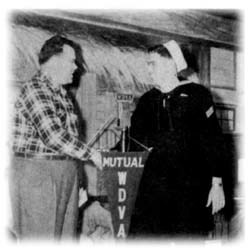 Each week, the Virginia Barn Dance would salute a member, male or female, of the armed forces as "Serviceman of the Week". 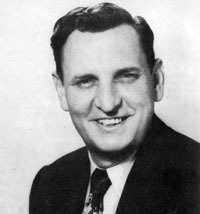 In this picture we found, Homer Thomasson is congratulating Bill Adams of Indianapolis, IN. 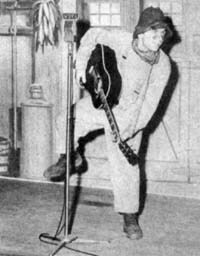 When the show knew it was going to have a larger crowd for special attractions or time of the year, the show moved from the barn to the outdoor stage and grandstand at the Danville Fair Association grounds. In addition, for fans of the show who didn't have a car, free bus transportation was provided from downtown Danville. And barn dancing or dancing in the barn wasn't the only thing that patrons got to experience at the Virginia Barn Dance. It seems that a couple of fellows would get together during the shows and talk of new ways to entertain the audiences. 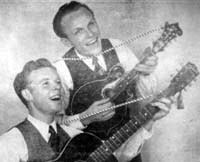 Curtis Finch, (manager of the Danville Fair Association) and Emerwon J. Pryor, (Vice-President and General Manager) of WDVA got together as they often did one summer night and developed something called "sand dancing" where the the dancers would take off their shoes and dance in the sand outside the barn. Not to worry that the dancers couldn't hear the music, the show had speakers outside. Not only that, patrons could check their shoes while 'sand dancing'.